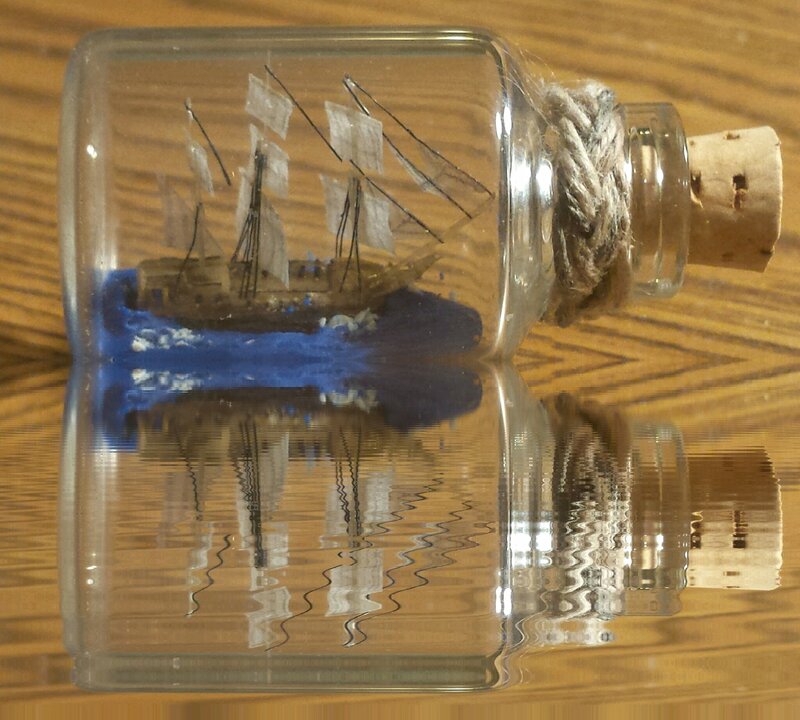 Happy ship in bottle day every one! Last night I found my project for SIB Day. It's the HMS Wivern that was a commission for the South during the civil war. The photo is a 1:48 scale model so I will be scaling down to fit it into a commercial light bulb. I hope to finish it by my birthday which is October 4th and coincides with SIB Day so the Preussen is on hold for now. Lord willing I'll make my completion date as it would be a great birthday present to me. I also have a nice drawing of it with sail and the bulwarks folded down next to the turrets to show how the ship enables a broadside salvo. I'll post that one tomorrow. 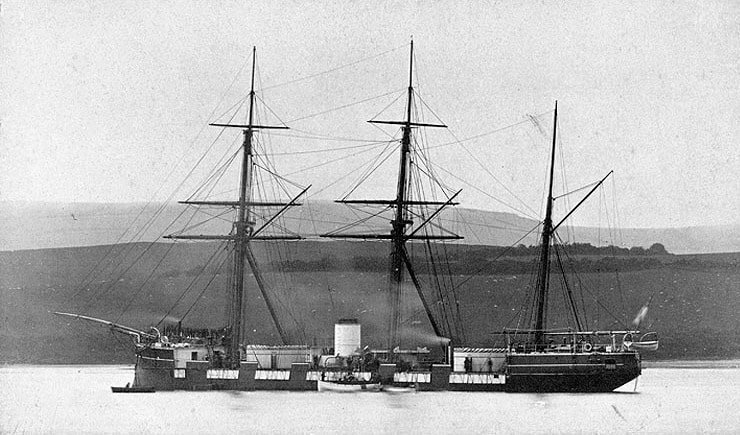 Wivern’ (1863) complete with tripod masts and rigging, deck hatches and skylights, capstan, steering wheel and a single funnel amidships. 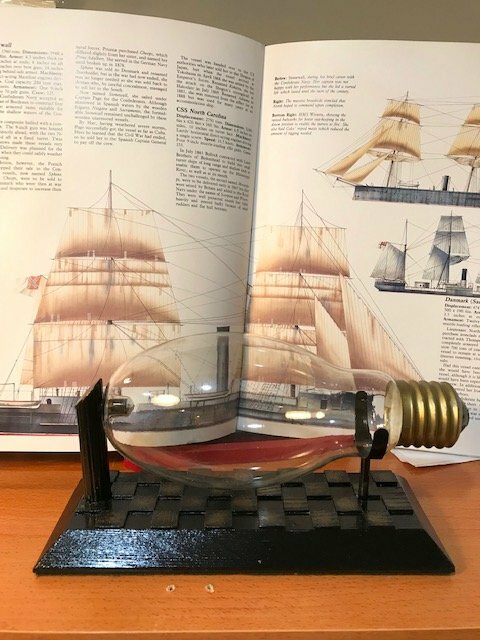 The whole model is mounted on keel blocks on its original wooden baseboard. 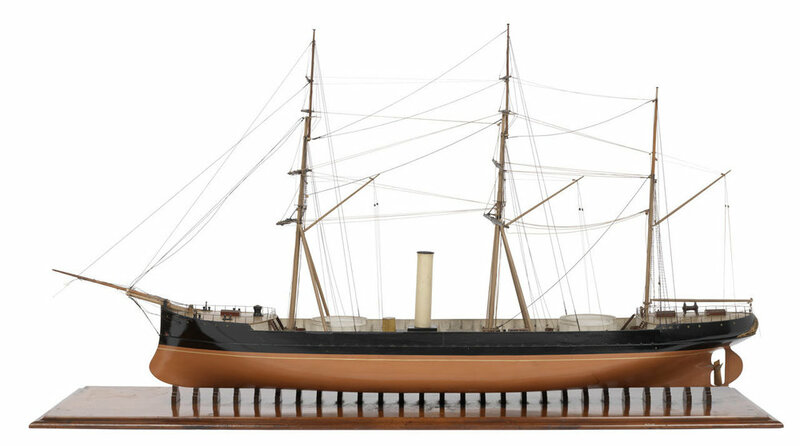 After the successful appearance of the low-freeboard turret ship ‘Monitor’ in March 1862, the Confederate States, during the American Civil War, ordered two double-turret ‘rams’ from Messrs Laird of Birkenhead. To avoid any political difficulties on the account of British neutrality in the war, these ships were ostensibly sold to Egypt and were actually launched under the names of ‘El Monassir’ and ‘El Toussin’. However, they were later seized by the British government and renamed ‘Wivern’ and ‘Scorpion’. Measuring 224 feet in length by 42 feet in the beam they had a displacement of 2750 tons. The guns in the two turrets were exposed by lowering sections of the hinged bulwarks and the tripod masts replaced most of the standing rigging thus providing a clearer line of fire. The ‘Wivern’ was sent to Hong Kong in 1880, and later in 1901 it was removed from the Navy List becoming a distilling ship and floating workshop until 1919. Here is a shot supposedly of the real ship taking on supplies from the internet. Notice the funnel stack is quite different in height and design from the model above. Here is the graphic of the ship with the sail from Warships and Naval Battles of the Civil War by Tony Gibbons. I got a chance to open up a light bulb yesterday. My buddy at work has collected various commercial halogen/incandescent bulbs for me. 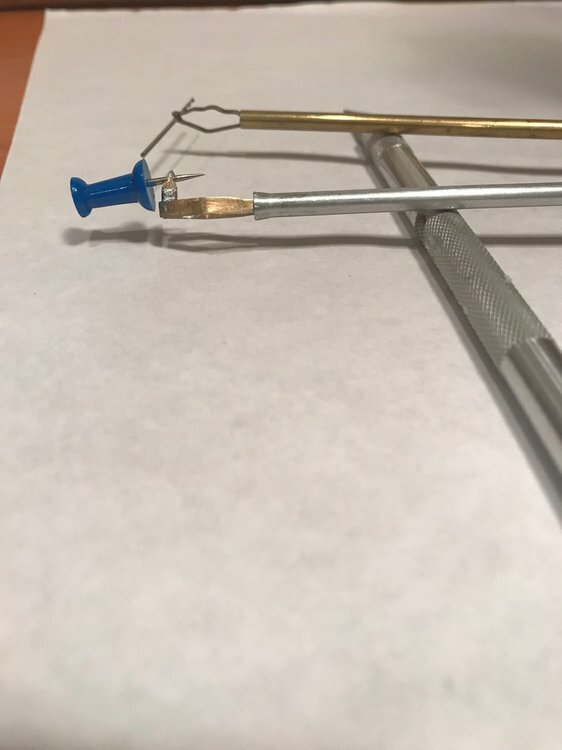 I used the method Greg Alvey talks about on his website to open a bulb with Muriatic acid. Because the inside is of a blown glass that seals a secondary bulb this was quite a feat! I had soaked the socket for 24 hours and then had to bust out the part where it screws into the fixture. Then re-soak to melt out the special glue that holds the socket in place. The glue was nasty, to say the least! Then once that was removed I used my Dremel with a dentist's diamond drill to go around the circumference to saw off the end. Once the end was removed I had to carefully bust out the filament end and remove the guts. The result is the last picture of the bulb sitting in my lap! 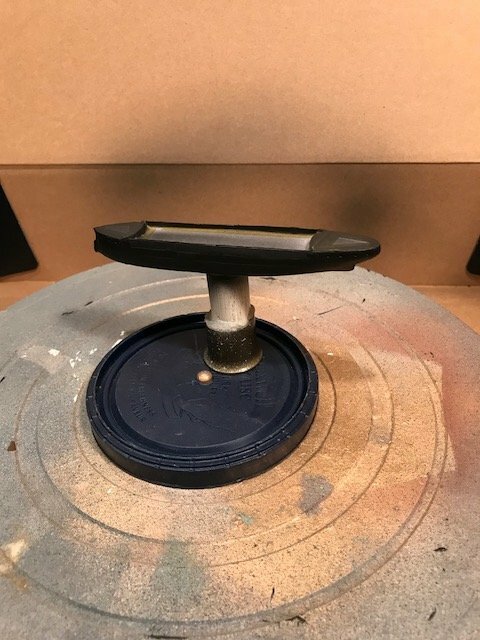 I'll have to fabricate a little wooden piece to build up the end of the socket (paint it black and then glue on the metal contact) as that part was destroyed in the process. Those bottles are tough. Ive broken a lot of them. I need to invest in acid and a diamond bit and see how that works. Do youbwant me to move this to the build log thread? You've got the start of good log here. http://The small interior bulb has mercury in it. Dispose properly not in regular garbage. I also use two bulbs. Break one for the end and the other cut about 1/4 to 1/8 from its end destroying the screw base. A diamond cutter works the best. Acid,etc no so much, personally don't use it. I have a lot of ends, want one? http://Do you want me to move this to the build log thread? You've got the start of a good log here. Sure Daniel why not? ? At Bluenoser ... I am okay no need to waste time and money sending me an end, however, thanks for the offer very gracious of you ...? Your welcome. BTW Chasseur are you CDN? Born,raised, and landlocked in Alberta all of my life to date. Located what I could find off of the Internet regarding a deck plan view and couldn’t find anything on a half breadth plan nor sheer. 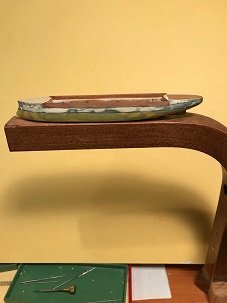 Next, the best thing was to make an actual half hull model of the ship. I had to scale down and then cut each sheer (starting with the bow) to gather appropriate templates to carve the hull out of some red cedar. I also rebuilt the end of the socket. I turned latter on my mini-lathe out of some cherry hardwood I had kicking around. The last picture shows the socket on the light bulb and it fits perfectly. I've heard a lot of good thing about red cedar. Looking great. I got the templates made so I am ready to start carving the hull. Started shaping the blank for the hull. 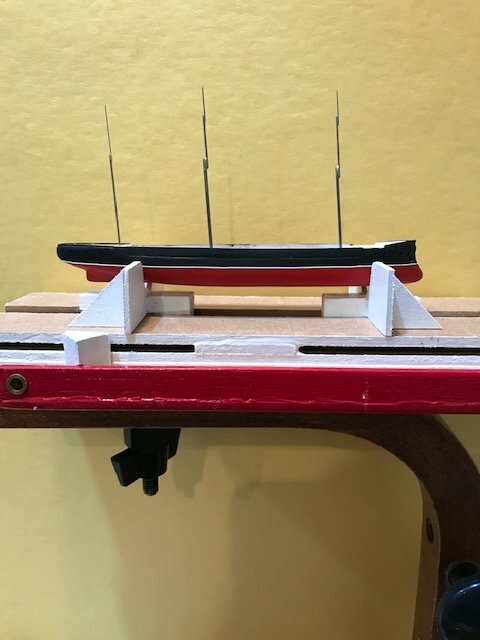 Slicing on top to model the folding down of the bulwarks so deck level has to be lower than forecastle and stern area. I also didn't like how my workstation was set up so I re-vamped it with a third-hand assembly and work tray. 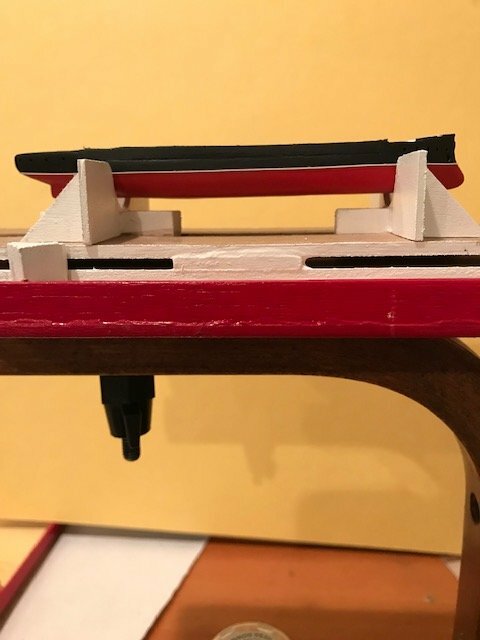 The tray swivels and is removable to add on other accessories and the whole thing comes off of my bench by removing 1 screw. ? I also pre-drilled the masts and funnel locations. The Wivern was quite modern with a mast rake of 5 degrees. I had a chance to work on the hull some more. I have it almost where I want it. There is one coat of Testor's Primer on it so I can apply some putty in the low spots and sand down before painting it out. The Wivern has a very unique hull and ram. The designer was way ahead of his time as the hull/bow resembles a WW1 Dreadnought design with a stern that emulates an extreme clipper ship in a way. 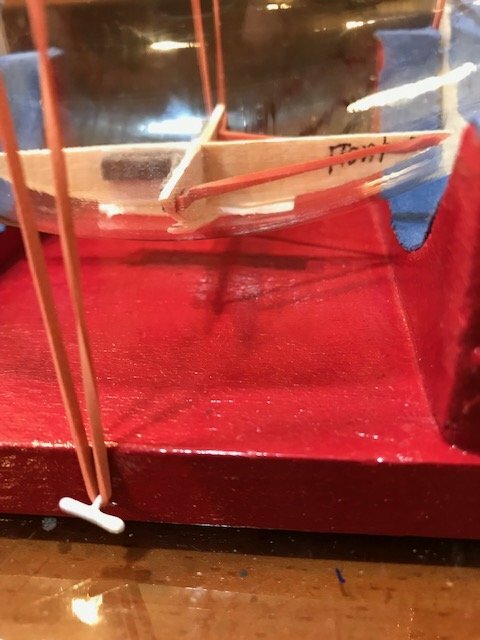 I also built myself an adjustable slip to hold the hull and it works really well. 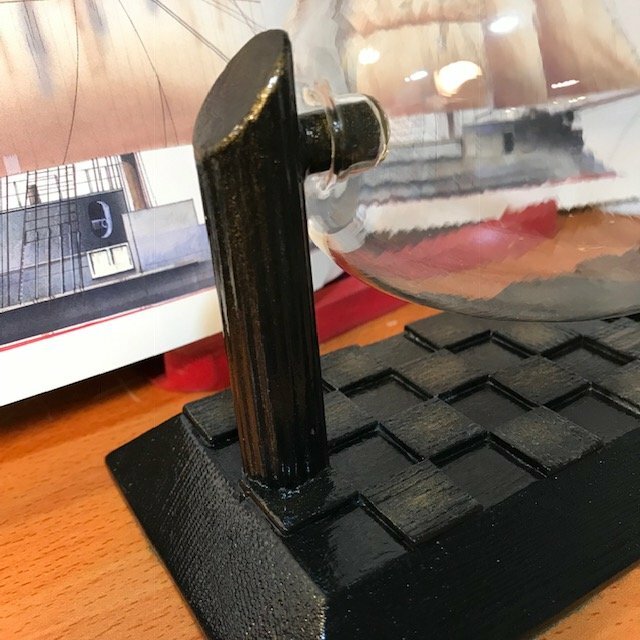 The idea came off of a post on Model Ship World. The stalks can slide back and forth to adjust and they press fit into the MDF base. 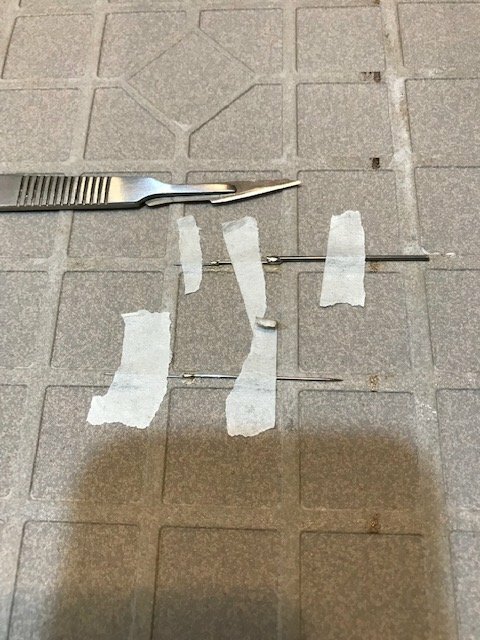 There are 2 wedges that locate it on the bed that are removable. I.E. triangular wedge bottom left by brass tube. Also the whole thing is removable by removing 1 threaded bolt. The 25 cent coin shows the scale. To the left is an adjustable work light powered by 3 watch batteries. Note bottom right aluminum angle fixed to bench with a wood screw. Take the screw out and the whole arm is removable. Both wedges are visible in this photo. Below shows a third hand and soldering station in which I just finished building a custom bottle tool. No picture yet-'Top Secret for now'... just kidding! I'll show it on another post. 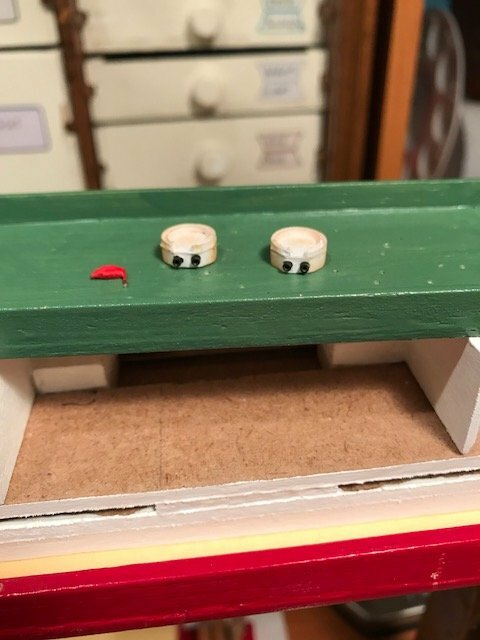 The little chrome eyelet at the front of the base is for directing all of the rigging lines away and below to ease the clutter. Above shows the versatility of my work station. 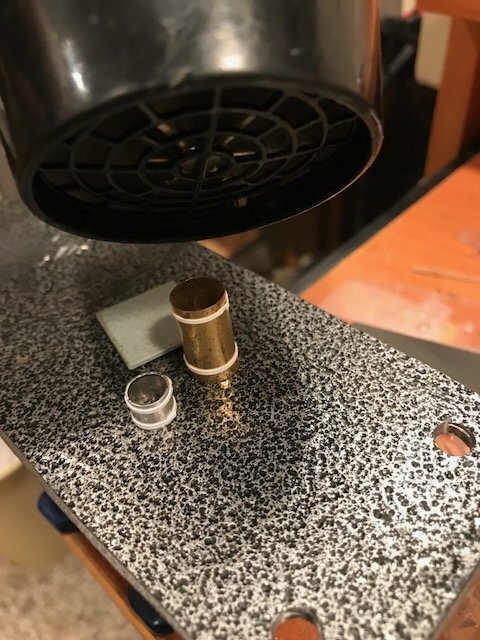 Below shows my mini vise on the arm as I cut out a piece of brass with my jewelers saw. PS FOR Weegee>>> the tools with the blue and yellow handles are home made miniature chisels made from sewing needles..
Nice work. I think I have to call you the gadget man ? As promised two pictures of gadgets I built for putting things inside the bottle i.e. masts with yards or what have you! One on the left has a spring for extra grip. 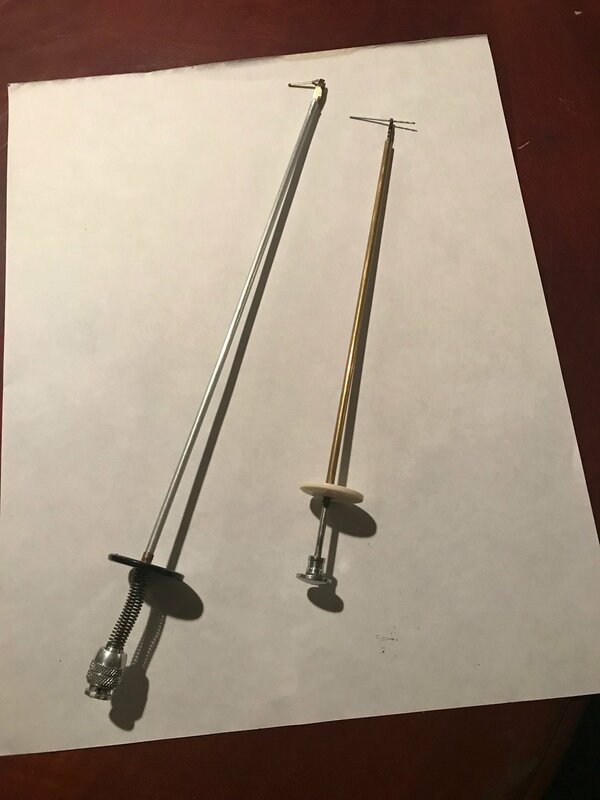 One on right is fine-tuned by an interference fit by sliding the rod back to create tension. Notice the gripping power. Also to create that grip, a dab of Gem tack was installed to fully dry on the inside of each finger. Today I was in the cave and put one coat of flat black on the hull after I sanded all the imperfections out. Bulwarks are glued on. Aforementioned made from thin veneer. I built the two turret/guns. I also fabricated the rudder and the prop as well. The bottom of the hull will be flat red and the top flat black. Here is the first coat of flat black. Still some sanding to do before the final coat. Notice the old record player turn table I use for painting. Having the ability to swivel the hull while painting is desirable. 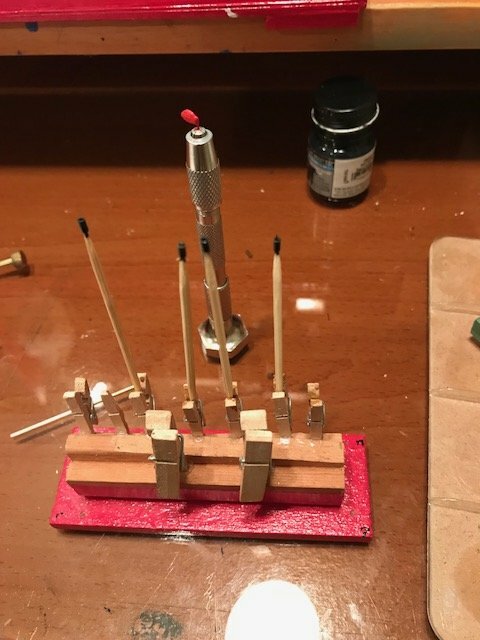 The rudder is drying in the pin vice and the four gun barrels are on the tooth picks. To make the tops of the turrets, paper is formed around some pipe and tacked with cyanoacrylate. Then the bands are soaked in water. Then they are dried with the rear Admirals hair dryer. Then they are simply cut off and they retain their shape which is marvelous. Two turrets complete with rudder. I weathered the turrets subtly with chalk to simulate some rusting. The bands are on the top of the turrets, just hard to see inner and outer bands. No zoom/micro close up function on my phone. I used my iPhone so closeups are poor. Prop was made from paper glued onto a toothpick. 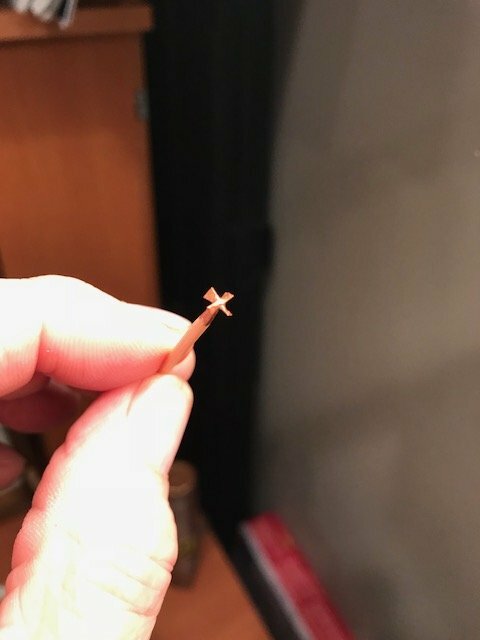 The end of the toothpick is perfect scale for hub assembly. Brazen brass was the color chosen. Tomorrow the hull gets its second coat of black on top, then I move to painting the bottom of the hull. Will work on more deck furniture et al. Well, I had big intentions of finishing this build by October 4th for SIB day and that was an absolute pipe dream. Life has been exceedingly busy taking care of my aging Mom and... we had a major incident at work which shut down 600 plus employees for almost 2 weeks. Henceforth I have been stupidly busy. Anyway attached is a bit of work on Wivern. I got the hull painted with waterline installed. I have 2 weeks off at Christmas hopefully I can get a lot done on her then? Got some time in the Man Cave to work on the base for the bulb and started on the masts and support for the hull. 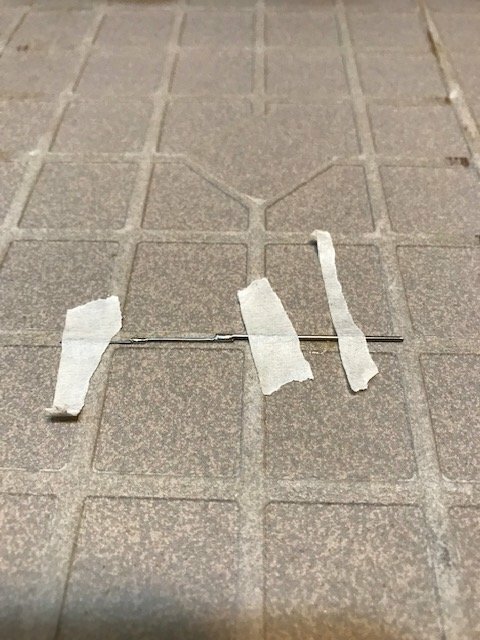 The masts are small wire and sewing needles soldered together. If you look closely there is a gold patina dry-brushed on the base and support structures for the bulb. 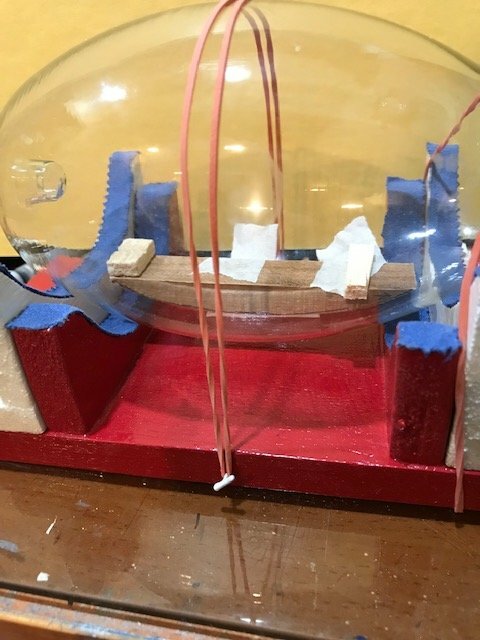 I made a special little tool to measure the contour of the inside of the bulb as well. Enjoy!